This article was written on 20 Nov 2018, and is filled under Author: dew. There are certain expectations that arise when viewing indie horror films on the convention circuit. In a genre that often requires extensive use of props, stunts, special effects, and intricate make-up and costume design, it’s not uncommon to see certain parts of production skimping on quality to devote more budget to other areas. Sometimes the effects are fantastic, but film quality and acting suffer. Sometimes film quality is beautiful, but the effects come off as sub-par. It’s a give and take that we expect when we know that hungry young filmmakers are working hard within limited means and have to make the tough decisions as to where they can devote the most of their capital. This is why it is such a breath of fresh air to come across an independent film that can score high marks in all of these areas, combined with a funny and imaginative script. This past Sunday we had the great pleasure of viewing the world premiere of Amy Taylor’s Hunter’s Weekend at Days of the Dead Chicago, a film that is poised to breathe new life in the horror-comedy genre after years of stagnation. The premise is simple but clever: an invitation-only ‘hunter’s weekend’ organized at a small state park goes awry when the hunters themselves become the hunted. What could have been an ordinary slasher is given a spark of originality in being filmed in a mockumentary style with two bumbling park rangers as de facto hosts. The rangers, who had been intent on documenting the weekend’s expected success, take it upon themselves to find the killer and set off on a hilarious cat-and-mouse chase through the woods, with their cameraman following along to catch all action. Horror-comedy, while a popular film genre, has been drowning in badly conceived spoof films heavy on gross-out humor and relying on slapstick for laughs for years now. We’re not going to point any fingers (Scary Movie), but each successive film has seemed to drag the genre a little further down. This fresh take from filmmaker Amy Taylor, who both wrote and directed Hunter’s Weekend, is exactly the direction we’d love to see the genre go. A self-professed fan of sitcom The Office and Taika Waititi’s What We Do in the Shadows, Taylor has managed to blend her love of mockumentary style humor with a slightly more sinister plot and create a small masterpiece of the genre that was a joy to watch. The solid script she created was complemented greatly by a talented cast who Taylor already had in mind as she wrote their roles. 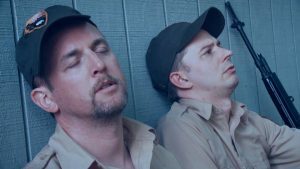 Benjamin Guenther co-stars as straight-man Lyle, the head park ranger at Sharpe-Silverthorn Memorial Park, with Christopher John Young playing his partner and comic foil, Victor. The two present with a mildly combative relationship, Victor the hapless yet devoted sidekick to Lyle’s more dominant personality, and above all, the two seem to take their film project documenting the weekend deadly seriously — even as the bodies begin piling up. “We have very strict rules about hunting other competitors,” Lyle intones to the camera, clearly more irked that his long-running hunting competition has been disrupted than the fact that there is a corpse on the ground. His deadpan delivery, combined with Victor’s more enthusiastic oddball persona, helps create the perfect atmosphere for this unconventional film. Christopher John Young shines as Victor, the quirky second-in-command at Sharpe-Silverthorn, whose desperation to please his boss runs measure for measure with his need to come into his own. The natural ease Victor displays in even the most macabre settings — speaking and gesturing without thought while holding a severed hand — adds to the almost surreal atmosphere and combined well with the film’s silly and snarky repartee. The film also includes Stefan Kumor as the smarmy Orlando, whose antagonistic relationship with chief ranger Lyle is best exemplified in his remark: “Sure, I give him a hard time, but it’s just because I hate him… deeply.” Emaline Williams plays Katy, a weekender at the park whose presence amps up the friction between Lyle and Orlando, and support cast is rounded out by David Lawrence, whose unsettlingly charming Eric is an absolute delight. In a brief Q&A following the film premiere, Taylor mentioned that she was working on another horror-comedy script, and we honestly can’t wait to see what she comes up with next. Kudos to Days of the Dead for giving the film a featured slot this weekend; more on the con itself to come on Wednesday. One more point: as a site that tries to feature independent voices in horror and has operated with a largely female writing staff, we’re pleased as punch to mention that not only was this film written and directed by a woman, but a large portion of the production crew was also populated by women, proving once against that a woman’s place is wherever the hell she damn well pleases. Hunter’s Weekend will next be screened at the Northeast Film Festival Horror Fest on Thursday, Dec. 6th, at 3:30pm. A Q&A with cast and crew will follow. If you’re in the area, we definitely recommend you check it out. We will keep you updated as information regarding further distribution becomes available. Images stolen with love from the Hunter’s Weekend Facebook page. Go like it. I have been a fan of Amy Taylor’s work ever since I saw Jess Archer Vs(also starring Kumor and Williams) She has a great since of style, looking forward to seeing this.